DESCRIPTION This is a larger than average Four Bedroomed Detached Executive Family Bungalow, positioned in this quiet village location of Boothby Graffoe, which lies between Waddington and Navenby, along the Cliff Village area of Lincoln. The property sits within a small development of two bungalows, behind Somerton House with views over the ‘Viking Way’. The property has internal accommodation to briefly comprise of; Reception Hallway, Lounge, Dining Room, Fitted Kitchen with Breakfast Room, Utility Room, Separate WC, Master Bedroom with En-Suite Shower Room, Family Bathroom and Three Further Bedrooms. Outside there is a double driveway and lawned garden to the front, providing parking for vehicles and giving vehicular access to an attached Double Garage. To the rear of the property, there is a landscaped garden with steps up to a lawned area, vegetable plots, greenhouses, shed and views over farmland to the rear. 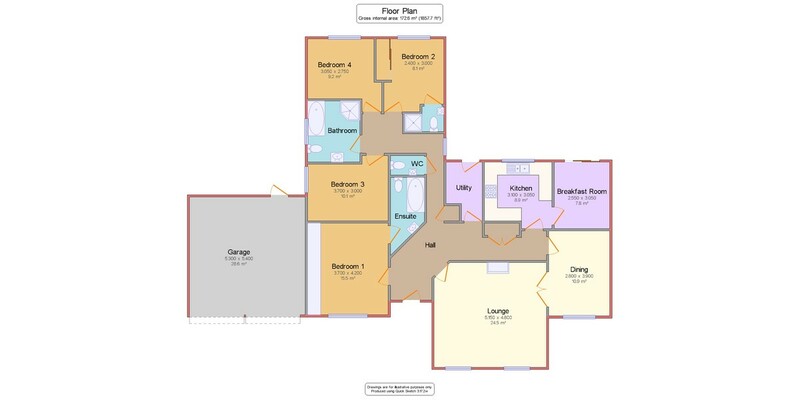 RECEPTION HALL With door to the front aspect, doors into the Lounge, Dining Room, Kitchen, fitted double wardrobe, Utility Room, airing cupboard, WC, Four Bedrooms, Bathroom, access to the roof void and radiator. LOUNGE 17′ 0" x 15′ 9" (5.18m x 4.8m) With two uPVC windows to the front aspect with long-range views, electric fire with brick surround, radiator, wall lights, double doors to the Dining Room. DINING ROOM 9′ 3" x 13′ 0" (2.82m x 3.96m) With uPVC window to the front, radiator, space for a dining table and door to the Inner Hallway. KITCHEN 10′ 2" x 10′ 0" (3.1m x 3.05m) With uPVC window to the rear aspect, fitted with a range of modern base units and drawers with work surfaces over, sink and drainer with mixer tap above. Integral double oven and grill with a four ring electric hob with extraction above, integral dishwasher, integral fridge freezer, wall mounted units with complementary tiling below, door to Breakfast Room and a floor mounted fan heater and tiled flooring. BREAKFAST ROOM 10′ 1" x 8′ 6" (3.07m x 2.59m) With uPVC sliding doors to the rear, radiator and tiled flooring. UTILITY ROOM 5′ 11" x 5′ 4" (1.8m x 1.63m) With uPVC door to the rear, space for automatic washing machine, tumble dryer and fridge freezer. SEPARATE WC With WC, wash hand basin and extractor fan. BEDROOM 1 10′ 1" x 13′ 10" (3.07m x 4.22m) With uPVC windows to the front aspect, fitted mirrored wardrobes and door to En-Suite. EN-SUITE 10′ 3" x 5′ 0" (3.12m x 1.52m) With tiled flooring, partly tiled walls, suite to comprise of; bath with shower attachment, WC and wash hand basin with vanity cupboard, extractor fan and chrome towel radiator. BEDROOM 2 11′ 2" x 8′ 6" (3.4m x 2.59m) With uPVC window to the side aspect and radiator. BEDROOM 3 9′ 10" x 9′ 1" (3m x 2.77m) With uPVC window to the rear aspect, radiator and fitted wardrobes. BEDROOM 4 9′ 1" x 10′ 6" (2.77m x 3.2m) With uPVC window to the rear, radiator and fitted wardrobes. EN-SUITE With suite to comprise of shower cubicle, toilet and small sink, partly tiled walls and extractor fan. BATHROOM 7′ 10" x 9′ 5" (2.39m x 2.87m) With uPVC window to the side, tiled flooring and walls, suite to comprise of; bath, separate shower cubicle, WC and wash hand basin with vanity cupboard and a chrome towel radiator. OUTSIDE To the front, there is a double concrete driveway, providing off-street parking for vehicles and giving vehicular access to the integral garage. There is also an extensive lawned garden with brick walling and pantile top and a paved area to the front of the property with flowerbeds. To the rear, there is a lower paved seating area with steps up to an extensive lawned garden, with raised brick beds, decorative gravel beds, steps up to a further shed and extensive lawns with views over farmland, greenhouses and a shed. DOUBLE GARAGE 17′ 4" x 16′ 8" (5.28m x 5.08m) With one electric up-and-over door and one manual up-and-over door to the front, door to the rear, oil-fired gas central heating boiler, electric trips, meter cupboard and power and lighting.